Laos National Football Team registered a 1-0 win over Buriram United of Thailand. Buriram United FC is the winner of Thailand FA Cup 2012 and qualified to play in AFC champion league 2013. Laos's goal came as a result of a free kick at minute 80. Laos has been preparing itself for the AFC Challenge Cup Qualifiers where it is hosting Afghanistan, Sri Lanka and Mongolia in Group C from 2-6 March. In preparation for AFC Challenge Cup Qualifiers, Afghanistan National Team played a friendly match with Etihad Fishwar, an Iranian club in Dubai today. 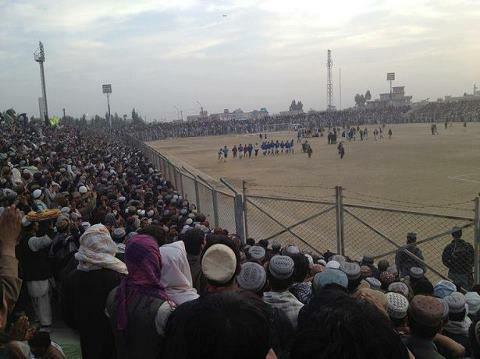 Afghanistan won the match 6-1. Amruddin Sharifi and Arash Hatifi scored a brace each, while Munirulhaq Nadim and Mustafa Azadzoy added two more goals for Afghanistan. 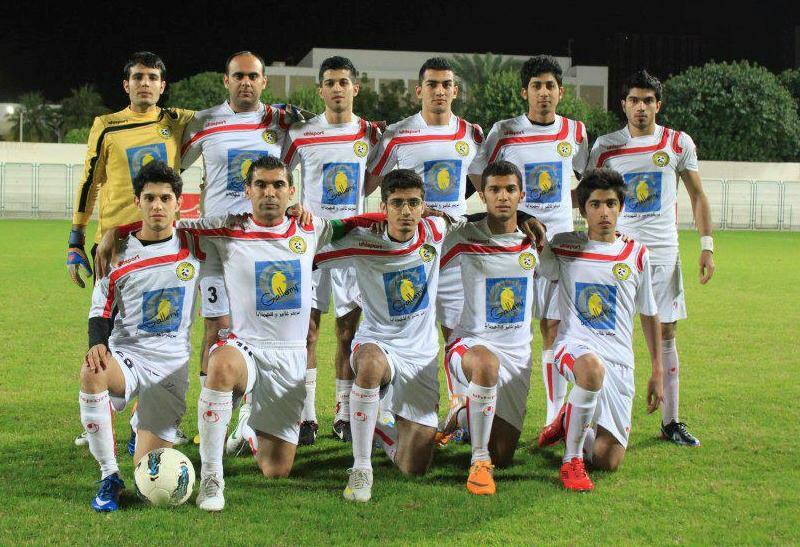 The Iranian club is a local club consisting of Iranian footballers in Dubai and has previously played with the National Youth Team of Iran and with some other clubs from Iran, UAE and other countries. Yousef Kargar, the coach of Afghanistan team, told such matches would help his team assess its abilities before the match. Afghanistan is having a practice camp in Dubai after which 23 players will make it to the final squad for Laos qualifying games. 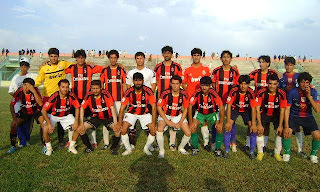 Mujtaba Faiz became the second Afghan player to play in the I-League of India. 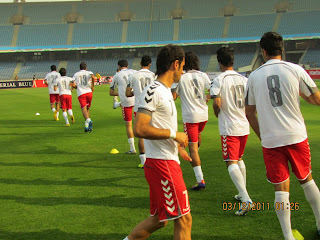 Islam Amiri has joined Mumbai FC two years ago and now he is the captain of the team. Faiz's recruitment is pending to medical check-up. 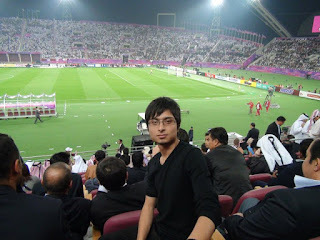 24 year old Faiz has played for Afghanistan on 3 occasions, but usually he has been a bench player.While he played for Foroozi, he also joined Shaheen Asmayee in the inaugural Afghan Premier League in 2012. Air India is in a difficult position with 15 points out of 15 matches at 11th position, 2 clear of the relegation zone. Istiqlal Moaref defeats Etehad Ghoryan in penalty shoutouts 4-3 to reach the next round. 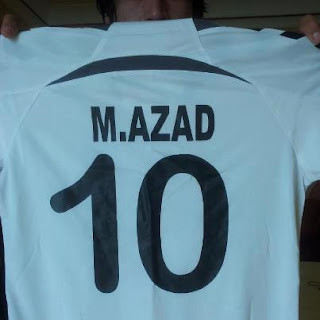 In under 19 league, Maiwand passed Pamir with 3 goals, while Etifaq and Payam Asia reached to a goalless draw. In under 16 league, Ariana made it 2-0 against Black Water and Maiwand defeated Piroozi with the same scoreline. 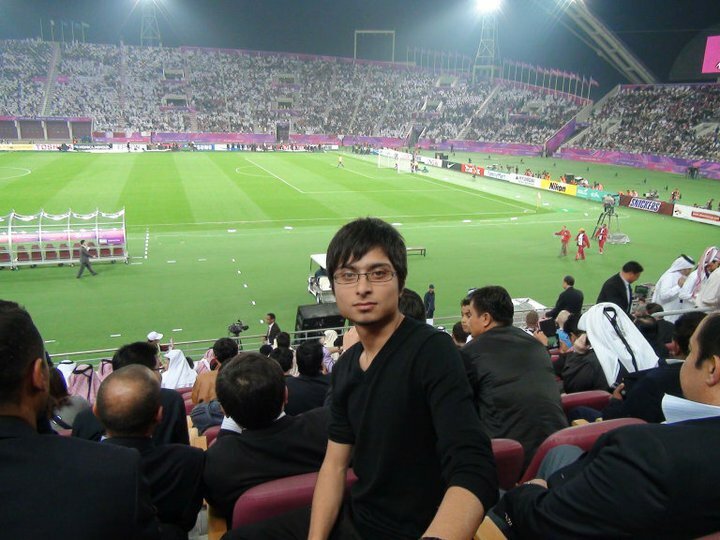 After Saudi Arabia failed to come to the match on the 11th place play-off match, Afghanistan was awarded a 3-0 score and thus secured 11th place in the tournament. It was Afghanistan's second victory after its victory in the opener against host Qatar. 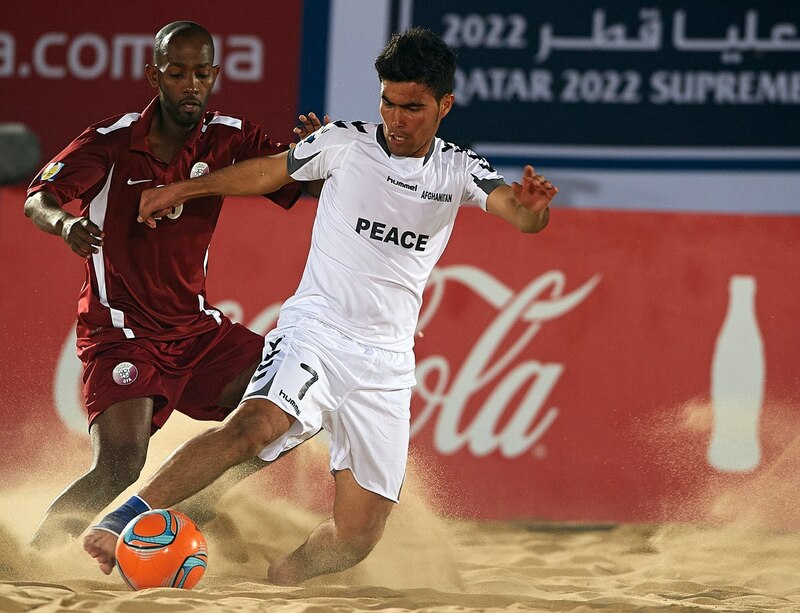 Iran, Japan and UAE made it to the Beach Soccer World Cup in Tahiti. 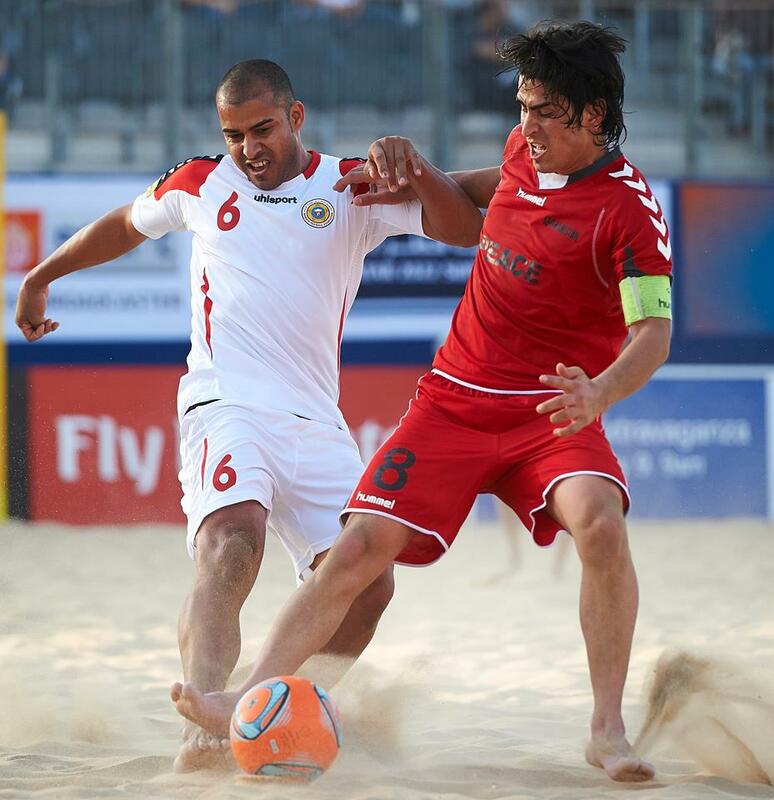 Afghanistan lost the change to fight for 9th place in Beach Soccer World Cup Qualifier after it was beaten by Bahrain 2-5. Baran and captain Mohammadi scored for Afghanistan. Mohammadi has scored 8 goals so far in the tournament and he is one of the favorites to win the Best Scorer Award if he scores for Afghanistan later today. The defeat means Afghanistan should play Saudi Arabia in the fight for 11th place at 4:45 pm (Kabul time) today. 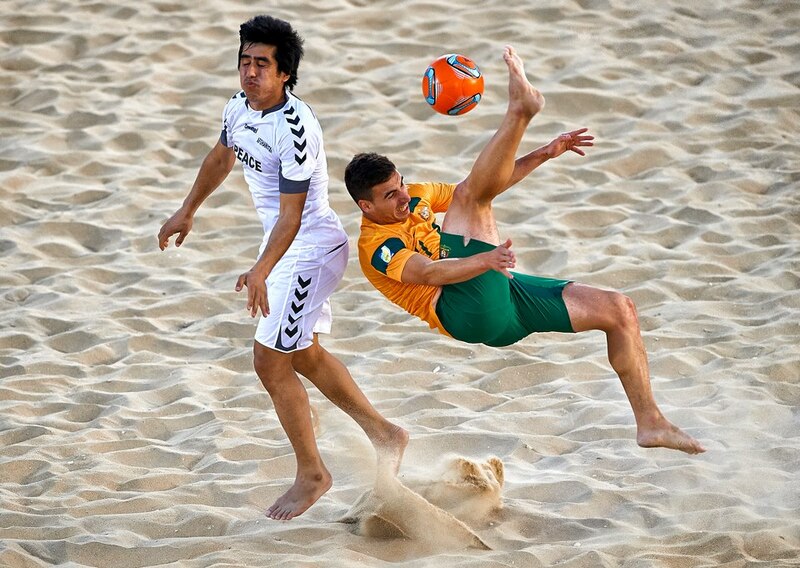 Afghanistan's hope of reaching the Beach Soccer World Cup was dashed today after they were beaten 6-4 by Australia. 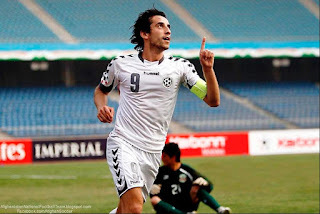 Afghan captain, Sami Mohammadi scored a hat trick and Mahmood Azad scored from the spot for Afghanistan. The defeat means Afghanistan collected only 3 points in the group stage and finished behind Australia and Oman in Group A. Qatar was defeated in all its 3 matches. Afghanistan is still to play two matches for 9-12 places play-offs. The matches will take place tomorrow and the day after tomorrow. 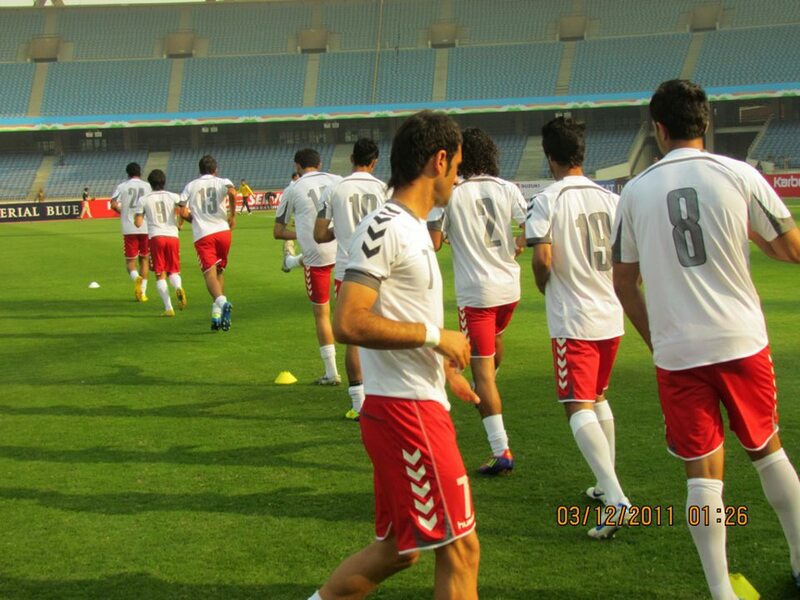 Afghanistan will face off Bahrain tomorrow at 4:45 Kabul time. If Afghanistan win, it will face the winner of Saudi Arabia-Iraq for the 9 place decider on Saturday. Japan, Iran, Austraia and UAE booked the semi-final births. This means one of them will miss out the World Cup, since Asia has only 3 spots. 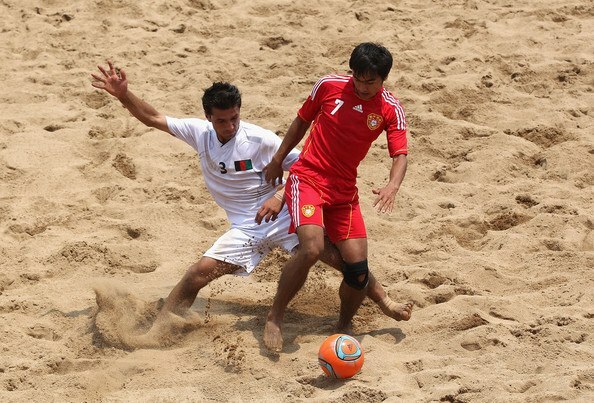 Afghanistan suffered a heavy defeat in the hands of Oman in its second match in the Beach Soccer World Cup Qualifier. Oman scored a brace in the first round, adding 3 and 2 more goals in the second and third rounds respectively. The match was not covered live by any TV channels. The AFF officials complain about the bias of the referee, however, no other source pointed out to this issue. 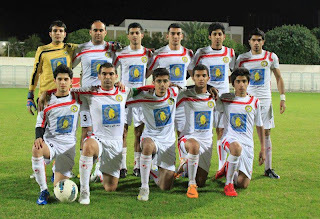 Oman finished runners-up in the previous qualifier. Afghanistan is going to meet Australia in its final group match tomorrow. 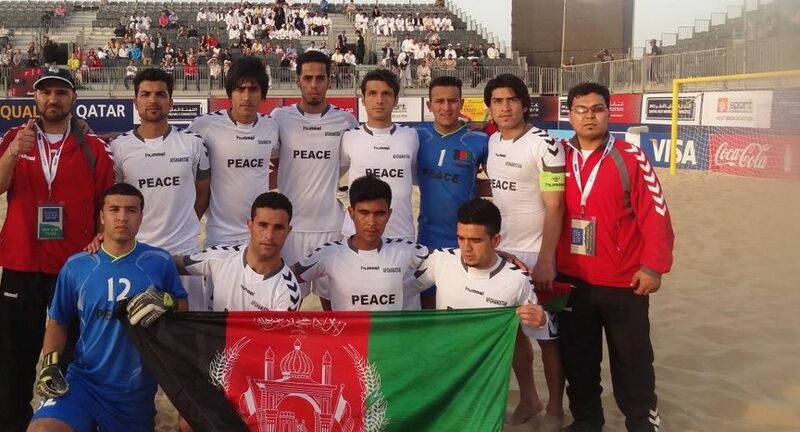 Afghanistan started its campaign in the Beach Soccer World Cup Qualifier (Asia) in style be beating the host country, Qatar. While Afghanistan started the match with cautious and received the first goal, it went on collecting all 3 points beating Qatar 7-3. Sami Mohammadi scored 5 times and Ali Raza Yaqoubi scored twice for Afghanistan, while the Afghan keeper showed heroic skills in defending Afghanistan's net. It was a full of events match as one of Qatari players received two yellow cards and was sent off from the pitch after the second interval. The referee had also a controversial decision after he reversed his decision of giving a yellow card to a Qatari player and a penalty kick to Afghanistan. Afghanistan is in Group A along with host Qatar, Oman and Australia. Afghanistan is playing Oman today (4:45 Kabul time) while Australia is playing Qatar (9:45 Kabul time). Only one team from each group will qualify for the semi-final. Afghanistan's 3 Sport channel is broadcasting live the matches of group A of AFC Beach Soccer World Cup Qualifier. Afghanistan, Oman, Australia and host Qatar are featuring in this group.Tamadon TV is also going to broadcast tonight's match. Afghanistan Football Team is beginning its practice camp ahead of the AFC Challenge Cup Qualifiers in Dubai tomorrow. 35 players are invited to join the camp where 23 will be selected for the final squad which would fight with Laos, Mongolia and Sri Lanka early March over a spot in the final tournament to be held in April 2014 in the Maldives. 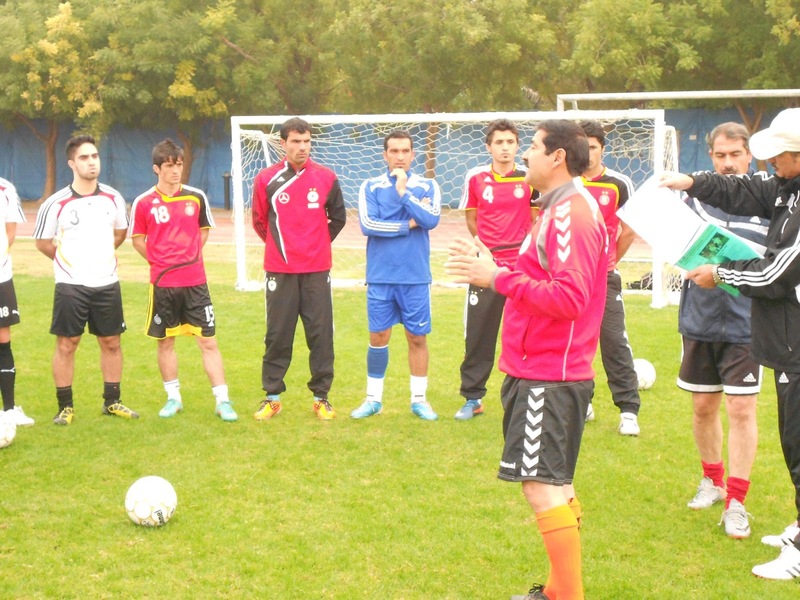 Kargar has invited 14 players from inside the country most of whom features in the inaugural Premier League of Afghanistan and 21 Afghan players who are playing Asian, European or American countries.After this initial 10 day camp, AFF will hold another 10 day camp in Dubai in late February for the final squad. There are rumors Afghanistan might play UAE senior or youth teams as well. The National Beach Soccer of Afghanistan reached Doha yesterday where it will compete in the Asian Qualifier for Beach Soccer World Cup 2013. Afghanistan will start its campaign tomorrow against host Qatar late at night (9:45 pm Kabul time). Afghanistan will meet Oman at 4:45 pm (Kabul time)on January 23 and Australia on its last group encounter at 6:00 pm (Kabul time). The Secretary General of Afghanistan Football Federation will leave for Bahrain tomorrow to discuss issues related to football. 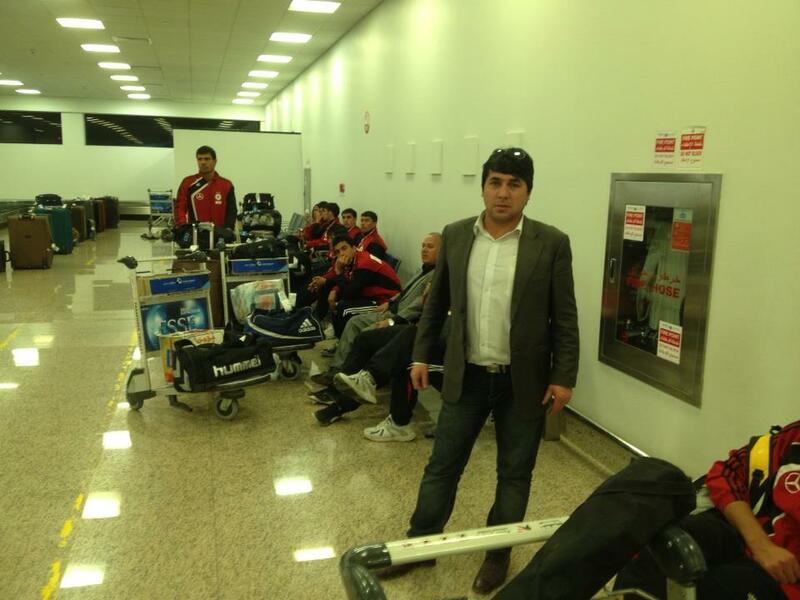 The trip is taking place at the request of Bahrain's football officials. 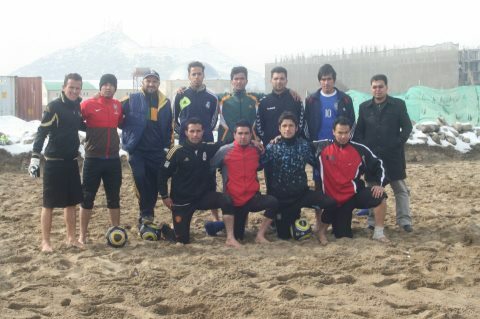 In recent years, a number of Arab countries are helping Afghanistan in different sports. 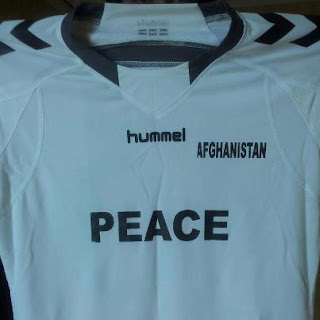 UAE, for example, has supported Afghanistan when it allowed Afghanistan to hold its practice camps in Dubai. 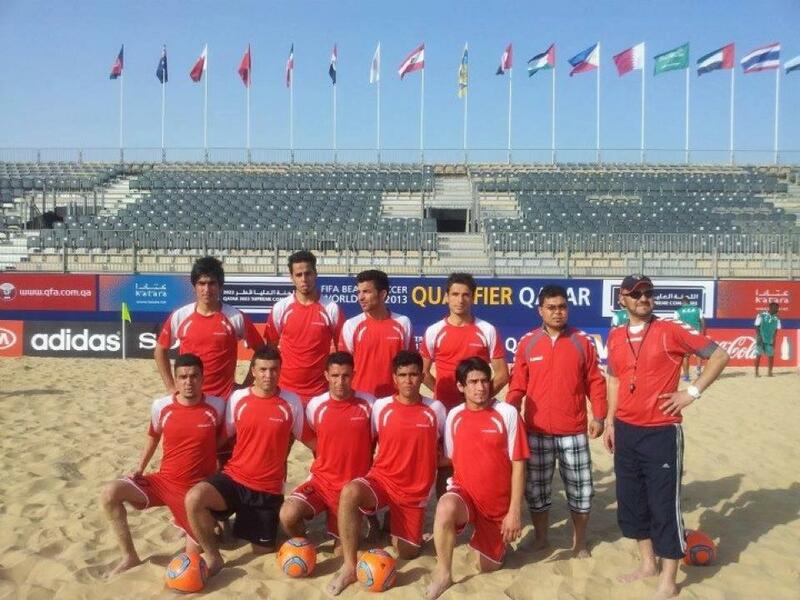 In addition, Qatar has supported Afghanistan Beach Football Team in its campaign in the Beach Football World Cup Qualifier. FIFA published its latest ranking of the national teams and Afghanistan is has kept the 186 position like the previous month. Afghanistan has only 39 points which are collected from 2011 matches. Afghanistan stands at 41 in Asia and 5th in South Asia. Balal Arzoo had offers from two Indian clubs early last year, but he refused the offers. Norwegian newspaper, Agderpostens, reports two clubs from India, Mumbai FC and United Sikkem, had competitive offers to the Afghan international, however, Balal rejected the offer since the offer was only for six months up to end of the season. The offer was equivalent of of a salary of a professional player in Norwegian league, according to the newspaper. "It was very exciting. The problem was that they wanted me down now for only six months. For personal reasons, it was difficult form me to accept" says Arzoo. However, he does not rule out joining an India club in a later date. "It may be possible for me to become a professional footballer there in July or August if I get a longer contract" says Arzoo. Arzoo is playing for Asker Club in Norway's 3rd tier club division. He has played in 7 encounters for Afghanistan scoring a total of 7 goals. He is expected to play for Afghanistan again in the AFC Challenge Cup Qualifiers in March. Yousef Kargar has invited more than 30 players from inside and outside Afghanistan to the national team for the preparation of the AFC Challenge Cup Qualifier. 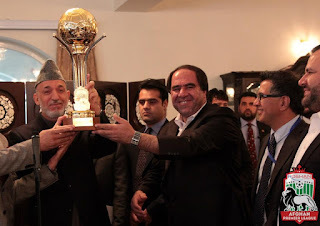 Afghanistan is placed with host Laos, Mongolia and Sri Lanka in Group C which will be held on March 2, 4 and 6. The domestic players already started their practice camp in Kabul earlier this week and will fly to Dubai for a 12 day camp where the foreign based players will also join. Kargar will select 23 players for the final squad after the Dubai camp. 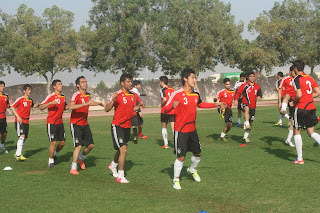 The practice camp of the national team started two days ago in the AFF Stadium in Kabul. The 14 domestic players who are called for the national team would have a 10-12 day practice camp in Kabul following to another 10-12 day practice in Dubai. 16 Afghan players who plays in USA, India, Bahrain, Germany, Norway, Sweden and the Netherlands will join the squad in Dubai. The Head Coach will select 23 players at the end of Dubai camp. A one week camp will also be arranged in Dubai right before the team travels to Laos. 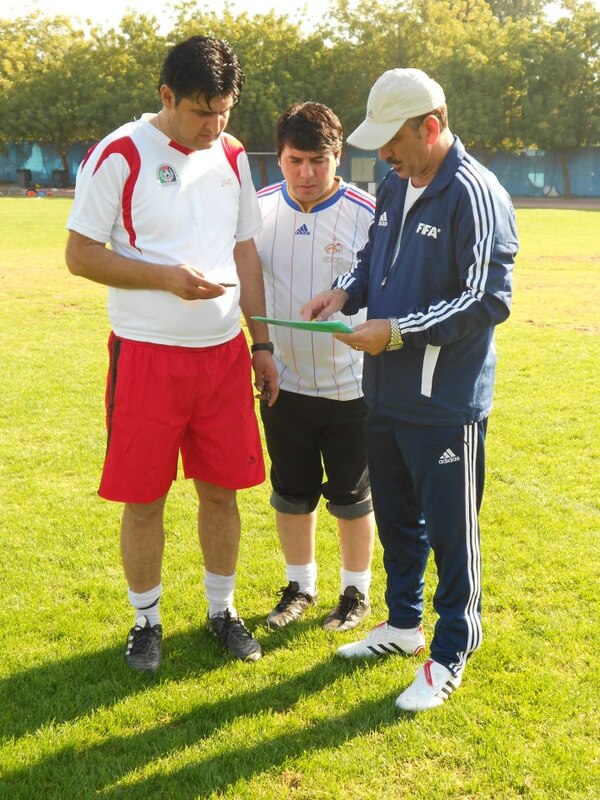 AFF is also arranging two friendly matches with two UAE clubs in the third camp. AFF has invited a number of players from the squad that played in 2011 SAFF Championship and a pool of players from the Premier League teams. AFF has not released the names of all invited players, but I can confirm Maqsood Hashimi, Wahid Nadim, Hamid Yousefzai, Moqadar Qazizada and Marood Mohammadi participated in today's practice session. Afghanistan is drawn with Laos, Sri Lanka and Mongolia in Group C of the AFC Challenge Cup Qualifier to be held between March 2-6 in Laos. Yousef Kargar said in an interview the qualifier and the main tournament are very important and he hopes Afghanistan can win and qualify of the AFC Cup of Nations to be held in 2015 in Australia. Kandahar provincial team beat Farah in the final of the Winter Cup which was held in Kandahar from two weeks ago. Kandahar scored 4 goals, while Farah only responded only with 2 goals. A total of 8 teams participated in the tournament: 2 teams from Kandahar, one team from Chaman, and provincial teams of Farah, Helmand, Kunduz, Ghazni and Baghlan. 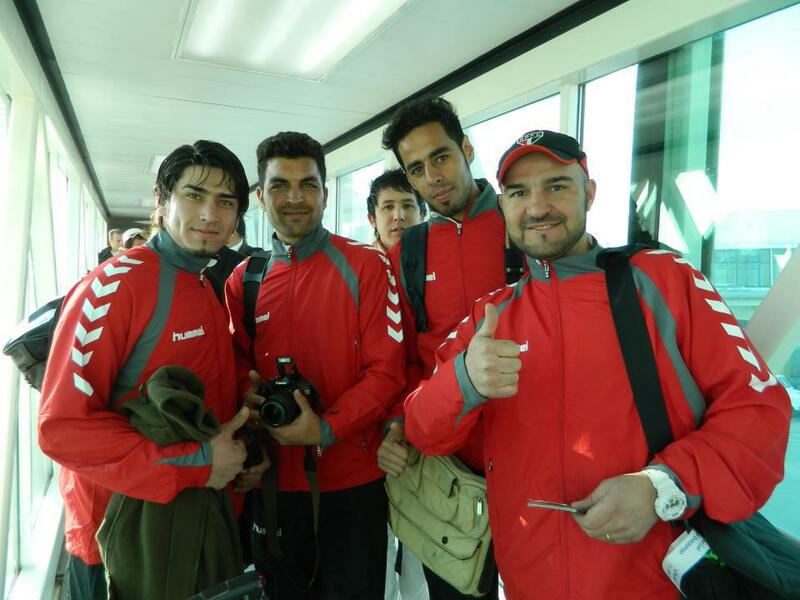 Meanwhile, Da Maiwand Atalan will meet Sherzai FC in a friendly match tomorrow. 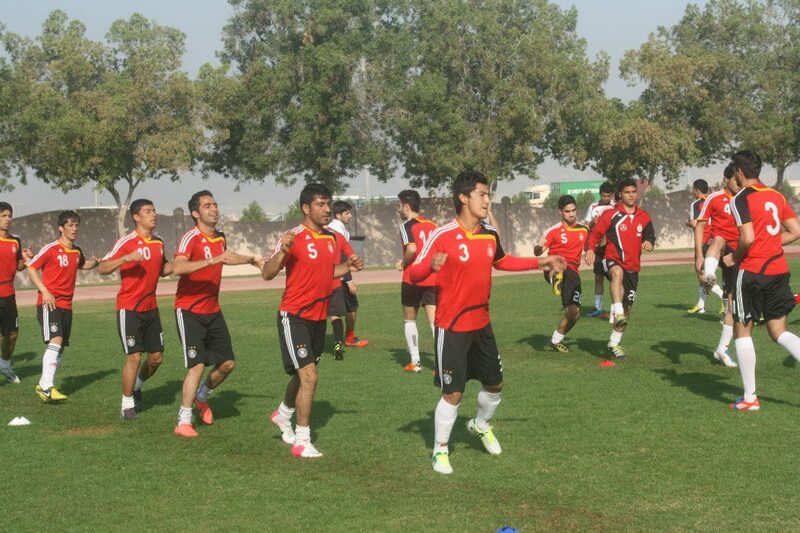 Informal sources told me AFF is going to organize a practice camp for the national team in Dubai in 2 weeks. The camp that will last for 20-30 days will feature a number of new players, most of whom played in the Afghan Premier League last fall. 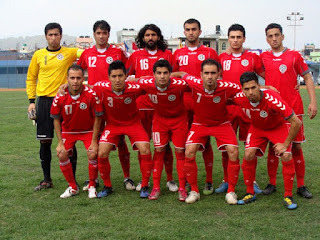 Interestingly, only 3 players from Kabul retained their places in the national team. Those are Moqadar Qazizada, Hamid Yousefzai and Maqsood Hashimi. Faisal Safa looks a big miss as we he was doing quite well in the defense. Same sources told AFF is organizing a press conference today in Kabul, apparently to release their plans for development of football this year. More details will be revealed at the conference. If true, that would be a great effort by AFF to prepare the national team for upcoming AFC Challenge Cup Qualifiers. Afghanistan has not played a single match in the past 13 months and a long preparatory camp is a must. At this stage, there is no talk on organizing friendlies. However, Afghanistan and Philippines can set friendlies in Dubai since both teams will have preparatory camps there almost at the same time. Afghanistan is placed with host Laos, Sri Lanka and Mongolia in the AFC Challenge Cup Qualifier Group C which will be played on March 2, 4 and 6 in Laos. Only the top team qualifies for the final stage along with two 2nd best teams among all groups. 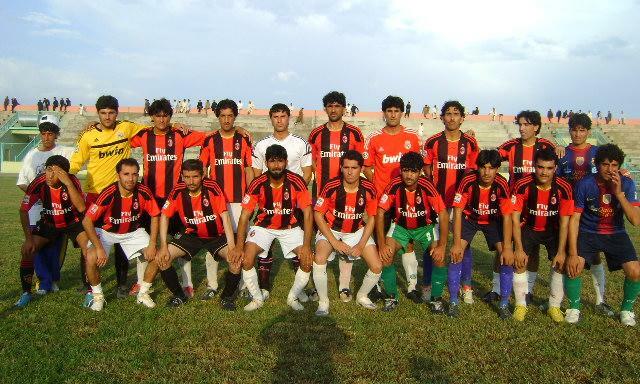 The Provincial Football Federation of Khost, in southern Afghanistan, has launched a 10 team tournament after which it will create its provincial football team. Ten teams are divided into two groups of 5. Group A features Club, Airport Team, Motoon Baba, Almara and Shahib, while group B consist of Mojahid, Hemat, Ismail Khail Caravan, Gharghasht and Youth Club. Top two teams from each group will fight for a place in final in 2 semi-final matches. Mujahid has already cemented its place in the semi-final. President of Afghanistan Football Federation asked for financial independence of AFF. Karemuddin Karem said on Monday his organization needs to know its budget and should have the discretion to spend it. Currently, the funds for AFF are transferred through National Olympic Committee. Previously AFF faced a lot of challenges in receiving its funds from the NOC. Meanwhile, FIFA awarded referee certificates to a number of Afghans. Sabir Azizi and Hamid Yousafzai are now international referees, while Hajar Abolfazl, Halim Aqa Shirzad, Forozan Tajali and Haidari have international assistant referee certificates. Sangar Women Club is crowned as the champion of Kabul women football tournament. Sangar beat Global Trust Women Team in the final of 10 team tournament this week. The tournament lasted 2 weeks and all matches were played in AFF Stadium in Kabul. AFF officials say they have selected 20 players for the national women team as well. Fahima from Global trust became the best scorer with 8 goals, while Mona Amiri, the youngest player of the tournament, became the best player. 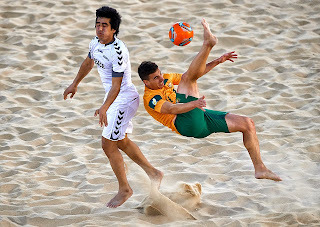 Media sources confirmed early this week Afghanistan's participation in the Asian qualification round of Beach Soccer World Cup. Afghanistan is put in group C along with host Qatar, Oman and Australia. The qualification will begin on January 22 and ends on 26 and Afghanistan hopes it can put a good display under the leadership of its Brazilian coach, Juan Marcos. The squad was finalized last Sunday. All players are coming from Kabul except for Ghulam Raza Yaqoubi, who is coming from western city of Herat. 14 countries have participated in the qualifier, while only 3 will make it to Haiti in September this year. 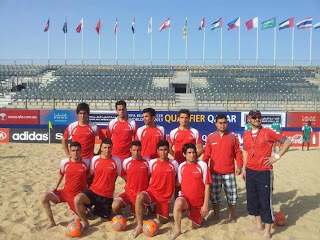 While the draw for AFC Beach Soccer World Cup Qualifier is held and 13 teams are divided in their respected groups, Afghanistan Football Federation hopes it can still participate in the qualifier. AFF says they have received a telephone call from FIFA and they were requested to participate in the tournament. The main reason behind not participation is lack of funds. Afghanistan participated in the Beach Soccer matches of Asian Olympic Competitions in 2012 where it finished bottom of the table after defeats against China, Vietnam and Palestine with 4-6, 3-4 and 0-7 scorelines respectively.